While it may take a little longer than your usual grind-brew-and-go cup, the slow drip cold brewing process is well worth the wait. 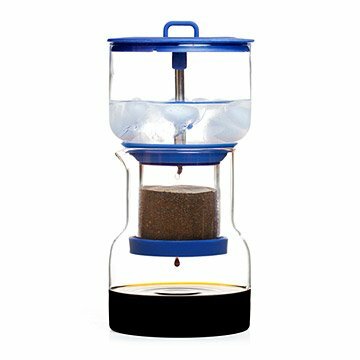 The slow drip method eliminates the risk of over extraction, a common issue with full immersion cold brewing, and yields a less acidic and bitter brew, highlighting the smooth natural sweetness and subtle perks of your coffee. Using this eye-catching coffee maker, you can harness the benefits of the cold brew method to produce up to 20 fl. oz of java in as few as four hours. Once set up, this clever machine does all the work and users can easily start brewing before bed or while at work to beat the midday slump. The coffee will last up to two weeks in the fridge and the dual-function lid can be plunged into the carafe to make an airtight seal. This method makes a brew that is slightly stronger than a normal cup of coffee and is best enjoyed over ice black or with a touch of cream and sugar. Made of borosilicate glass, stainless steel, and food-grade silicone in China. Click here to learn how to use your Cold Brew Coffee Maker. Our Senior Data Analyst put the Cold Brew Coffee Maker to the test. You can read about the results of his experiment on our blog. Gabe Herz and Andy Clark met while working at a product incubator in the Santa Cruz Mountains. Gabe holds a BS in Mechanical Engineering and Andy holds a BFA in Industrial Design. To Gabe and Andy, brewing coffee is not just about the end product, it’s about the ritual behind it. Every step is an intimate action that leads up to that first sip and the resulting satisfaction that comes from knowing that cup of coffee is your artistic creation. Read a Q&A with Gabe on our blog. Remove the silicone filter ring and plug from the tower over a trash can. Then give the tower a quick vertical shake to remove the used coffee grounds. Lastly, rinse the Cold Brew Coffee Maker with warm soapy water. "Can produce up to 20 fl. oz. of cold brew coffee. Like mentioned, we purchased this for a raffle donation for a water quality tradeshow that our company exhibits at. Being that water and coffee are very much connected, I thought it suited the occasion perfectly. A coffee drinker will be very happy with this!